That sounds great Beccijo. My family did a cleanse last year and our nutritionist had us do the same but also add things like egg shells. She also suggesting breaking the bones to let the marrow out. I highly recommend not doing this with your hands (am I showing I was a vegetarian for most of my life?) because I cut myself badly when they snapped. 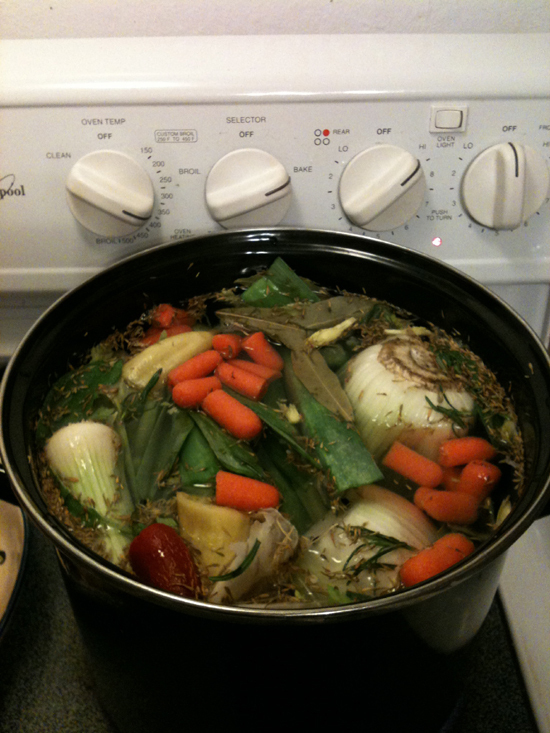 Then we would freeze the strained broth and have it once a day. Yum! I’ve never thought of keeping the ends of veggies! And eggshells??? Wow, I’ll have to have a garbage tub in my freezer! I make stock every time we have roast chicken but never could justify putting veg in, it seems like such a waste to me, but ends i’m chucking out, great idea!